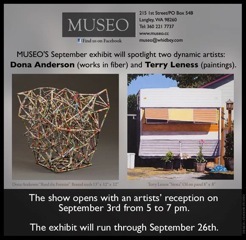 Two Fiber Artists to Show in Langley this Weekend! 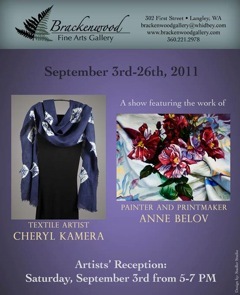 On Sept. 3, 2011 Brackenwood Gallery welcomes Anne Belov and Cheryl Kamera as our featured artists. Anne Belov, painter and printmaker and Cheryl Kamera, textile artist will blend their two mediums in a show that promises to be rich in color, texture and pattern. 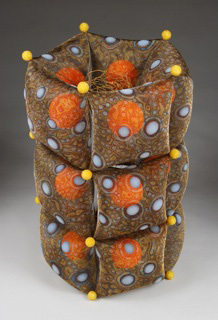 Please join us for an Artists’ Reception on Sept. 3, 2011 from 5-7 PM. The exhibit continues thru Sept. 26, 2011. To see more of Cheryl’s work, please click here. Fiber seems to have taken over Langley. 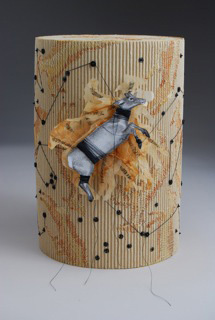 some time with Cheryl’s exhibit, consider stopping in on another exhibit at Museo featuring fiber artist, Dona Anderson. The Gail Harker Creative Studies Center has moved . 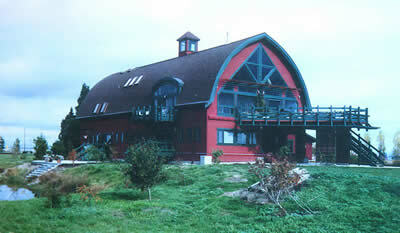 The Center’s new home is a converted barn in La Conner, WA. Classrooms are located on the first level, and there are plans for new office spaces, a new library and an on-site gallery. Classes began in July and several new classes have been added to the calendar. To learn more visit www.gailcreativestudies.com, or visit Gail’s blog at www.gailcreativestudies.wordpress.com. when the Level 3 Design students exhibit their work. SDA Member Chad Alice Hagen offering workshop next week! It runs from August 29 through September 1st. For more information click here. Two Great Felt Workshops Coming Up! 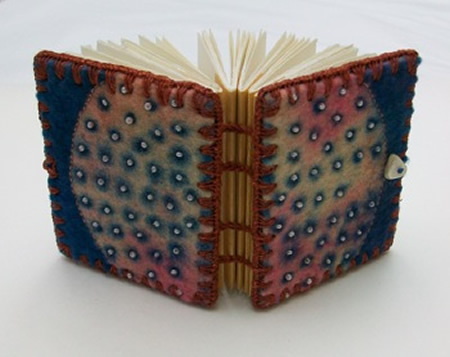 SDA member, Tricia Stackle is offering two wonderful workshops in Sculptural Felt and Felted Clothing. This is a great opportunity to take your felt to a whole new level. 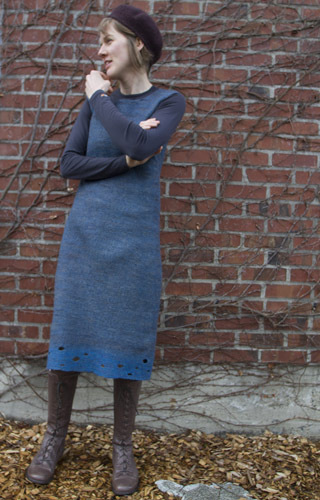 Feltmaking is an exciting media growing in popularity both in the art, craft, and design fields due to its transformative properties and delightful tactility. I have been working with the ancient, renewable resource, wool, in my own design and art practice for a few years now and am excited to be able to offer two exciting workshops to share my experience with feltmaking and teach new techniques in both sculpture and fashion to interested and eager artists and craftspeople looking to learn about this media for the first time or as experienced makers. 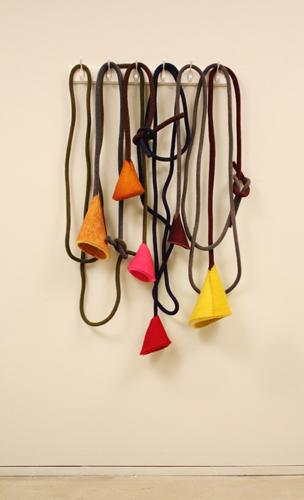 The Sculptural Felt is being offered August 27 – 29, 2011 from 10 am – 6 pm at the University of Washington – School of Art. Cost is $385 with materials included. 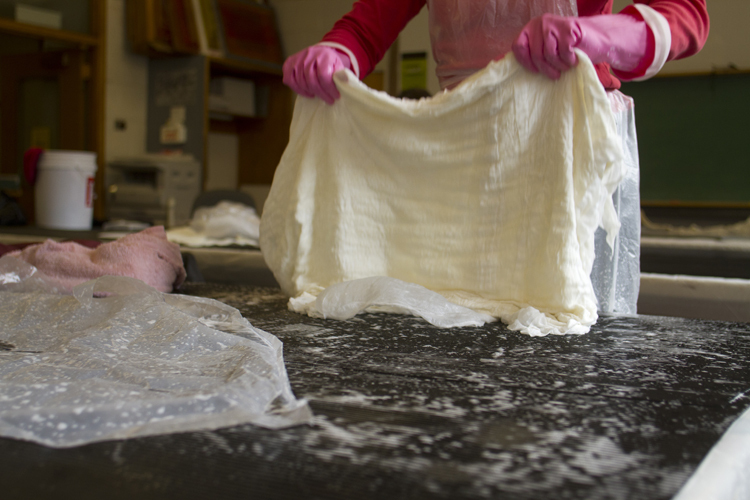 The Felted Clothing workshop will take place September 9 – 11, 2011 from 10 am to 6 pm also at the University of Washington. Cost is $385 with materials included. For more information about both of these workshops, please visit: www.triciastackle.com. Click here for an enrollment form. Try the Anacortes Art Festival this Weekend. Bergner will be showing in The Anacortes Arts Festival exhibition entitled, Then/Now. festival’s permanent collection along with more current work by the artist. Both SDA members have several pieces in the show. The exhibition closes Aug 7 at 5:00 and is open during the three days of the AAF street fair.